Back in southern Alabama in the 1940s, Down the River Road by Mabel O’Donnell was the title of my first grade reading book. It was the Peterson Company hardcover 1949 edition with illustrations by Florence and Margaret Hoopes. Alice and Jerry and Jip went on a trip with a donkey cart, and… I don’t remember any more plot, if there was much of one. But I remember the pictures. I remember being excited about the concept of reading, but bored to death by Jip & Co.
Evidently I stored the memory of the book’s smell and heft back in the locker of the hippocampus. When Marty Greenberg asked me, a hard science fiction writer, to contribute to After the King: Stories In Honor of J.R.R. Tolkien, I recalled that time when the lush banks of moist rivers around Fairhope, Alabama were my fantasy lands. Would a work be fantasy, though, if I wrote from my larger experience as a scientist? But they wrote about fantastic matters of the past, not the future. 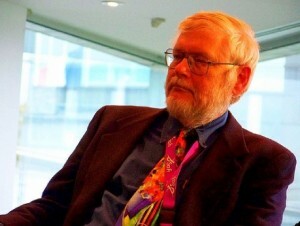 Science fiction is a form of writing but it’s also a way of looking at things – a mode of thought. It requires mental landscapes more demanding and inventive than modernism. So, I thought, why not create a far future landscape of fantastic, sufficiently advanced technology? To those who live in that place, it’s natural, unremarkable, yet mystery sleeps beneath. Their advanced technology is indistinguishable from magic, to them–yes. Yet a young writer would be a fool to follow such theory, I thought when I began writing this piece. Teach yourself by your own mistakes; people learn mostly by error. Or at least I did, mostly—plus the authors named above, and Hemingway and Heinlein. I came from the backwoods, so I thought of a fantasy that just might be about a riverland derived from mysterious science indistinguishable from magic. A place that reeked atmosphere. We remember smells more acutely than the other senses because we evolved from a tiny rodent scuttling in the underbrush, avoiding the dominant dinosaurs, living by smell rather than sight. Our big brains cantilevered on long spines evolved from that rat’s smeller, so we can’t ignore smells. We remember them, can be snapped back into our past by their fragrant power. The South is a smelly place. Southern settings seem, in the mind’s eye, to have an almost automatic, fantastic glaze, with strong scents. We readily call up images of brooding purple ruins, green corpses, melancholy figures shrouding a dread secret that reeks of musty shadows. Edgar Allan Poe, the first great Southern writer, started it all–along with the detective story and, indeed, the short story itself. Reading him, you meet a lot of scents. The South has played a strong role in American fantasy, but little in science fiction. I came out of the South a striver. I moved from the succulent South to live and do physics in dry, crisp southern California. So when I think of fantasy, I see the South. California is science fiction territory. 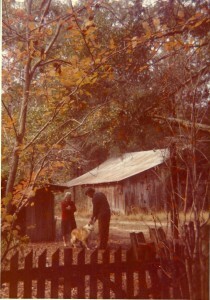 Here’s a 1974 photo of me with my grandmother in the yard of her farm, a few hundred meters from the Fish River where my brother and I explored swampy reaches in search of imagined buried pirate gold. My grandmother died soon after this photo, and this last visit with her stirs still in memory. Southerners feel their difference from the beginning. Though I have written fiction about abstruse physics and the people who care about such abstractions, all quite urban delights, I have always been aware that I come from a far distant culture. 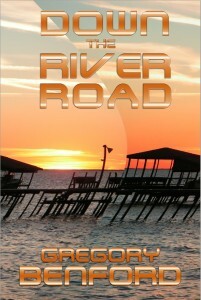 I grew up in the rural small towns of Robertsdale and Fairhope, across the bay from Mobile. From my birth as an identical twin in 1941 until my father took us to Japan in 1948, I lived a simple and probably idyllic life, amid a Huck Finn world of sluggish heat, muddy rivers, infinite pine forests, and abundant creatures. E. O. Wilson relates in his memoir Naturalist how the same land made him into a fervent biologist a decade before and only a dozen miles away from my home. Yet somehow, despite a lifelong fascination with the myriad complexities of the natural world, I became a physicist. I also learned something of storytelling. My step-grandfather, universally called Mr. Fred, even by my grandmother, told tales beside a crackling fire in the tin-roofed house on stilts beside the Fish River. (The pictures in the story itself are from the Fish.) He smoked a fragrant pipe that blended in the air with the woodsmoke. I listened to the cadences and swerves of dense, Southern spinning, and found it marvelous. Decades later I found a recording of Faulkner, one of my favorite authors, and heard my grandfather’s identical accent telling stories that seemed to flow from some unfathomed wellspring, and knew that I came from some roots that ran deep. It was an idyllic time. My brother and I had no childproof lids on medicine bottles, doors or cabinets and when we rode our bikes, we wore no helmets. We rode in cars with no seat belts or air bags. A ride in the back of a pick up truck on a warm day was great bouncy fun, not cause for parental alarm. Or even driving a tractor to clear away corn stalks, a great adventure at 9. We drank water from the garden hose and certainly not from a bottle. We ate real butter and drank soda pop with sugar in it, but stayed slim because we were always outside playing. There were no “play dates,” just play. We fell out of trees, got cut, broke bones and teeth and nobody filed a lawsuit. We got BB guns for our birthdays and didn’t put out very many eyes at all. I even recall running through the house with scissors. We were athletic. I tried out later for a basketball school team and didn’t make it. OK, not my sport. (Later, I learned to surf pretty well, and scuba.) We liked sports and had freedom, failure, success and responsibility; we learned. of physical labor and the clear idea that in the long run it might be better to work inside and sit down a bit, too. My relatives who stayed in farming got beaten down then fairly badly by age fifty, and not many lived long lives. (My grandfather died of lockjaw (!) before tetanus shots existed.) So I went first into engineering and then quickly realized I liked my physics pure and undiluted. Eventually I became a mathematical physicist, then went back to doing experiments and running labs—mostly because there’s nothing like hands-on work; labor, again. And experiment has the raw rub of reality. Nature bats last. So now I dwell in a vastly different world. 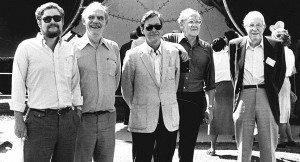 Here’s a photo from the 1980s of me on the left, the other sf writers arrayed in front of a Saturn V laid on its side in Houston: Fred Pohl, Jim Gunn, Brian Aldiss, Jack Williamson. All these sf writers write out of their own experience—all writers do—and yet we go a-roving into futures and places no one has ever seen. We imagine times determined by technology, often strange. It’s the trade. So, considering how to use this background of mine, I went back to that reader, Down the River Road, stole the title entire, and wrote a story about a place that recalls the South …and yet it’s a place where time is an active flux, not a remorseless ticking reminder of our mortality. This story is a blend of hard sf ideas and the fantastic. You can work out where these people live, and that it’s a tubular place where somehow space-time warps. Yet this place feels old: the rural setting, country mannerisms, odd technologies that recall our past. I enjoyed writing this expedition into the territory of fantasy. Many readers have remarked on how this novella seems like both past and future. I think fantasy’s ability to convey familiar feelings and resonances, among quite different atmospheres, is much of its power. After the King is still in print; Tolkien stands the test of time, though his work is set in the distant past. I’ve added photos to this new edition of the novella, and 600 new words. I wanted to convey the atmosphere of where my brother and I grew up—always a deeply felt place, lingering in the mind. I hope this new form works for you. The book appears for now only in e-editions.